Perfect Way To Wait For The New Year: Jenga® GIANT™ JS7 Hardwood Game! One of the biggest challenges that we face, whenever it is New Year’s Eve is staying wide awake before the clock hits twelve. Even if we watch our favorite movies, shows, or play a video game, we’re then quite surprised when we see that it’s still a few hours away from midnight. 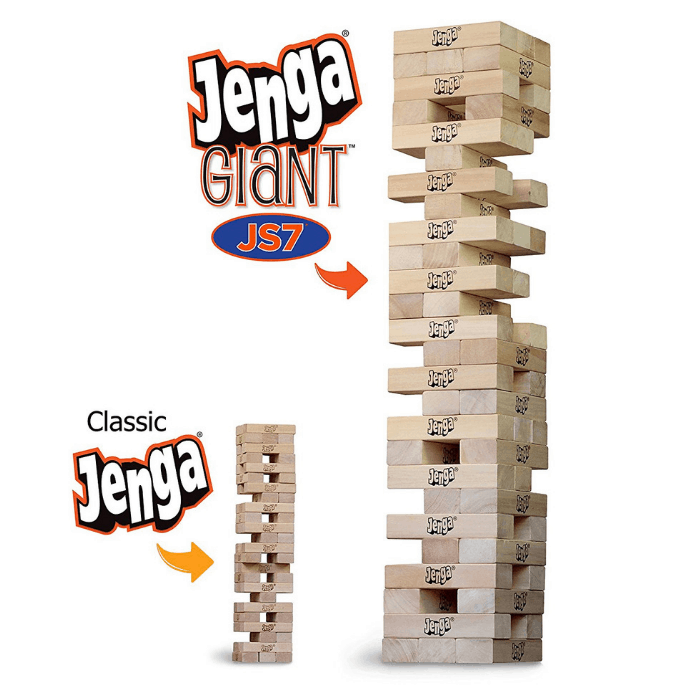 If you’re looking for an exciting way to wait for the New Year, the Jenga® GIANT™ JS7 Hardwood Game is the way to go! This is an entertainment highlight at any event and party. Don’t miss the chance to grab the Jenga® GIANT™ JS7 Hardwood Game from Amazon for just $118.50 PLUS FREE shipping! Play with your family and friends! The set includes a Jenga SPORTS Tournament Charts for competitive play. The biggest authentic hardwood Jenga game ever sold! Starts at 2 feet high at setup and can stack to over 5 feet high in play! Includes Jenga SPORTS Tournament Charts for competitive play. Now it’s a SPORT! Fun to Play! Exciting to Watch! Comes with the Heavy Duty Jenga GIANT Carry Bag for easy storage and transport. 54 precision-crafted polished hardwood 7.13″ x 2.38″ x 1.38″ blocks, each one nearly 15 times the volume of a Classic Jenga block.